In my recent post about my using Sound Devices’ USBPre 2 as a location-live recording interface, I mentioned the “near-coincident” ORTF stereo microphone technique. In that case, I used an AEA stereo mic protractor ($22) to position two Pearl (Sweden) CC22 cardioid-pattern side-address microphones in the so-called ORTF array. The ORTF array is a compromise between crossed-axis “coincident” X/Y cardioid or figure-8 microphones, and “A-B” widely-spaced omnidirectional microphones. The idea is to mimic the response of the human head/ear/brain system concerning horizontal-plane stereo cues, while preserving good compatibilty to monophonic mix-down, by which I mean the avoidance of self-cancellation. Most ORTF arrays involve the use of two identical cardioid microphones in some kind of mount or adapter. However, legendary German microphone maker Schoeps has long offered a unitary ORTF rig: a T-shaped enclosure with small-diaphragm condenser capsules at each end, fixed at an included angle of 110 degrees. Schoeps’ ORTF array has a street price of circa $3333. A pair of Pearl (Sweden) CC22s have a street price of about $2160. But I understand that such prices are outside the reach of amateur recordists, musicians, and educators. I somehow learned about Superlux’ S502 ORTF array, which for all the world looks like the working-class version of Schoep’s ORTF array, but which costs 90 percent less. Superlux’ S502’s street price is: $240. A pair of the Pearl CC22s will set you back about $2200. I did not have access to Schoeps’ ORTF array (which I am sure is fantastic, as has been the case with every Schoeps mic I have ever used); but I did have access to a pair of Pearl’s CC22. So on two occasions several weeks apart, I asked Steve Martorella to play Domenico Scarlatti’s D-minor Aria. First, using the $2200 pair of Pearl microphones, and then the Superlux ORTF, which costs a little more than one-tenth as much. 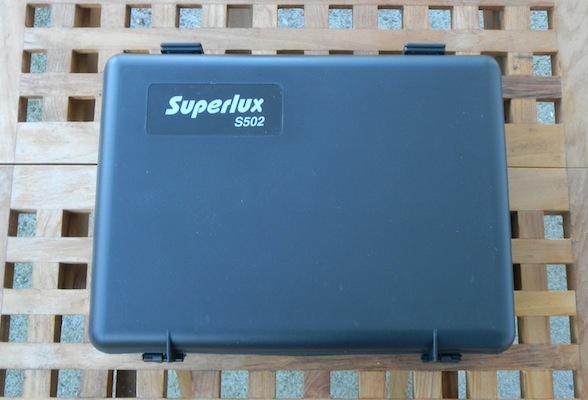 The S502 comes in a plastic briefcase lined with die-cut foam. Recesses hold the microphone, its stand mount, two foam windscreens, and an adapter cable to break out the right and left channels from the 5-pin connector at the base of the microphone. The microphone capsules are half an inch in diameter, and are spluttered with 3 microns of gold. The microphone itself is sturdy and well-made, and weighs just under one pound. The S502 requires 48 volts of phantom power. 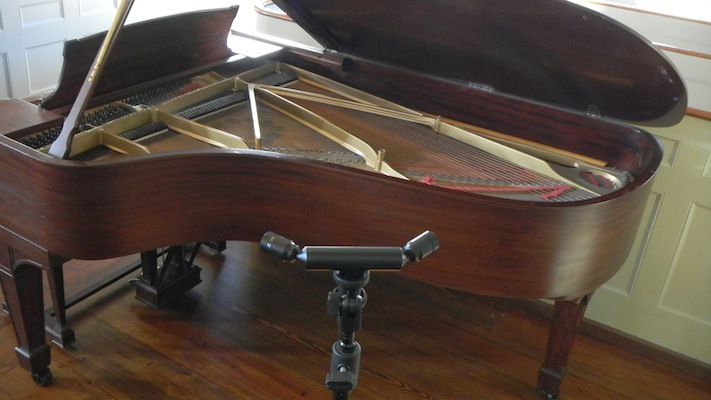 The payoffs from using this positioning technique include a greater sense of the spatial localization of individual notes, but without the drawback of the stereo image making you feel as though you were sitting on the piano bench. The practical payoffs include that the technique is repeatable and predictable, and has given good results in a wide variety of rooms. 1. Domenico Scarlatti: Aria (Sonata) in d, K. 32. Pearl CC22s in ORTF array. 2. Domenico Scarlatti: Aria (Sonata) in d, K. 32. 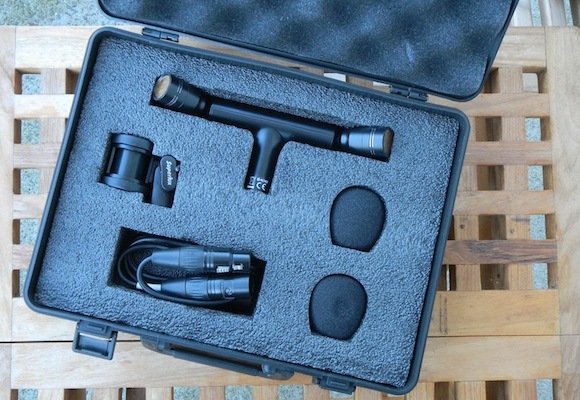 Superlux ORTF stereo microphone. The high-resolution 24/96 .wav file of the S502 is available from this Dropbox folder. To my ears, the comparison (on solo piano at least), is actually very close. The Superlux ORTF is very impressive, and the 10X price differential is not to be sneezed at. I will note that I experimented with the S502 on classical guitar and on my speaking voice, but I did not have time to make any other comparisons, such as choir or organ. So, if you are looking for a stereo mic array that will give very impressive results by any standard, and which is a screaming bargain, do check out Superlux’ S502. Highly recommended. Thanks, very interesting. I assume you are in the U.S. and where did you purchase the S502? What recorder did you use? I’m considering the S502 to close-mic a Steinway D, mostly to capture more detailed sound and to give some mixing options for spatial perception of stereo. My idea is to mix (1) the ORTF positioned close over the strings with (2) a pair of Line Audio OM1s (SD omni condenser mics) used as A-B pairs positioned roughly two meters from the piano, mostly to capture some of the rather nice room and the incredible low end of the D.
My concern about budget mics is quality/variance so I’d like to buy from a domestic U.S. source to return it easily if I get a noisy dud. There is also at least one seller on Amazon.com. I used the Sound Devices 702 as a recorder–you can see it hanging from the mic cables. However, that is a 2-channel recorder. For four channels you would need a 740-series from Sound Devices. As far as thoughts go… I have two ideas but they involve more than 2 or even four channels. 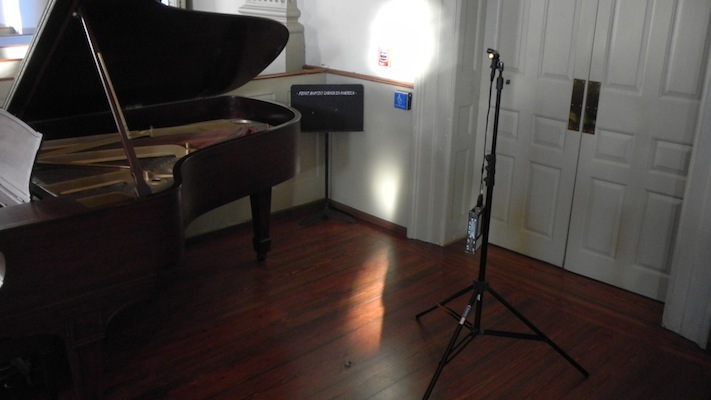 First, to get all the low end, one approach is to put one mono pressure transducer true omnidirectional mic (which are expensive; Schoeps makes excellent ones) UNDER the piano, and either record it 180 degrees out of phase with the mics that are above the soundboard, or record it normally and then invert it in mixing. The purpose of the phase inversion is to get mutual reinforcement of the bass in the two arrays rather than phase cancellation. Just mix in enough, perhaps even with a HF EQ roll-off, to give the bass a real solid foundation. Then compare the result to the top array alone. Two, and this is a John Atkinson technique, move the room mics even farther out, say 15 feet, but use a clapperstick to create a reference point before each take so you can slide the room mics forward in time so they make their ambient contribution within the Haas-Effect window, and you get bloom but not so much swimminess.